← Sewing Plans – I Don’t Need Sewing Plans! 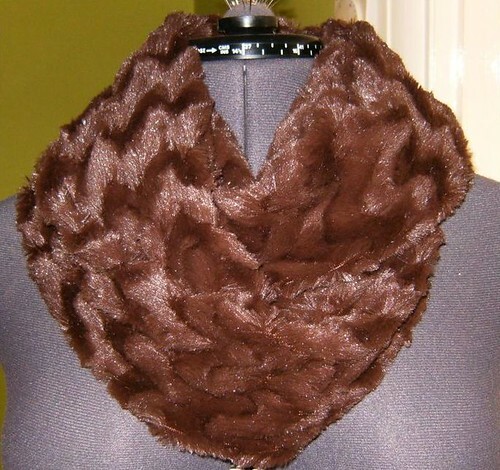 After altering the brown top in my previous post, I thought I’d do a quick project and make the faux fur scarf. This was so easy and so cheap. I simply took the 1/2 metre of faux fur that I’d bought and squared off the cut edges. I then sewed the two long (cross-grain) edges right sides together to make a tube. I then sewed the two ends of the tube right sides together as far as I could with the machine (probably about 3/4 of the way round, then hand-sewed the remaining unsewn part of the seam on the right side. This was easy to do because the faux fur means that the stitches simply melt into the fabric. This took less than an hour and I really love the final result. This is it worn twisted twice around Dolly’s neck. It cost a grand total of £2.50 and taught me a valuable lesson – I really don’t like sewing with faux fur. I’m happy to have discovered this while making a simple scarf, rather than discovering it when attempting to sew a coat! I would sew another one of these if I find another really soft, snuggly and affordable faux fur, but I doubt I’ll ever attempt anything more ambitious with this type of fabric. I’ve also finished the brown jersey top that is part of my original six plans, but I don’t have a photo of the finished article yet, so I’ll post about that later. 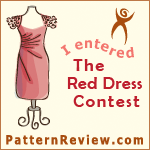 This entry was posted in Finished Projects, Sewing, Uncategorized and tagged faux fur. Bookmark the permalink.